The most recent groundwater analysis shows that in little over a year, the chemicals detected in the aquifer under the mountain of coal ash at AES plant in Guayama — such as selenium, lithium and molybdenum — exceeded the maximum allowed by the U.S. Environmental Protection Agency by four to 14 times. The consumption of these three elements has been associated with skin inflammation, acute pain, vomiting, weakness, liver dysfunction and death from poisoning, according to the U.S. Department of Health’s Agency for Toxic Substances and Disease Registry. During the same period the concentration of heavy metals such as arsenic, multiplied by five almost reaching the level of toxicity established by the EPA, while others, such as lead and cadmium, also showed significant increases. Considered by the World Health Organization (WHO) as one of the 10 most alarming chemical threats to public health, arsenic in water has carcinogenic effects, according to the WHO International Center for Cancer Research. Even in low doses, it can cause irritation to the stomach, lungs and intestines, and in the long term, growth problems, neurotoxicity, diabetes and pulmonary and cardiovascular diseases. “Now, the problem is that once the contamination reaches the water, it’s not just there. Pollution continues its path, dispersing, and then a local problem becomes a regional problem, which threatens the rest of the southern region,” he added. “That combination of elements isn’t common. They are the chemical fingerprint of coal ash,” he continued. Restoring the area’s aquifer to its original state, however, is “a fantasy that AES believes possible, but it is not,” according to Dr. Rosario-López. “It is a fantasy to think they can regenerate that aquifer. The best they can do is to remove the ash from the surface so they don’t contaminate more, but the well is useless,” he said. “There is no viable technology that would return it to its original state. Not for heavy metals [such as arsenic and lead]. It would take tens or even hundreds of years for it to be naturally cleansed. Due to the size of the area and the volume of the aquifer, it’s not practical with existing technology to remediate and bring back that aquifer to levels that it can be potable water,” he reiterated. That opinion was backed by Nelson Cardona-Martínez, a professor with 30 years of experience in the Department of Chemical Engineering at the University of Puerto Rico, Mayagüez Campus, who also warned that any remedial attempt would be costly and unsuccessful. The three scientists agreed that the worst aspect of this saga is how AES continues to elude its responsibility for the places where their coal ash have been used as a filler in the construction of houses, shopping centers and roads. Some of these deposits have been going on for 15 years in 12 Puerto Rico municipalities, while AES’ mountain in Guayama has accumulated up to 430,000 tons of ash since 2014. 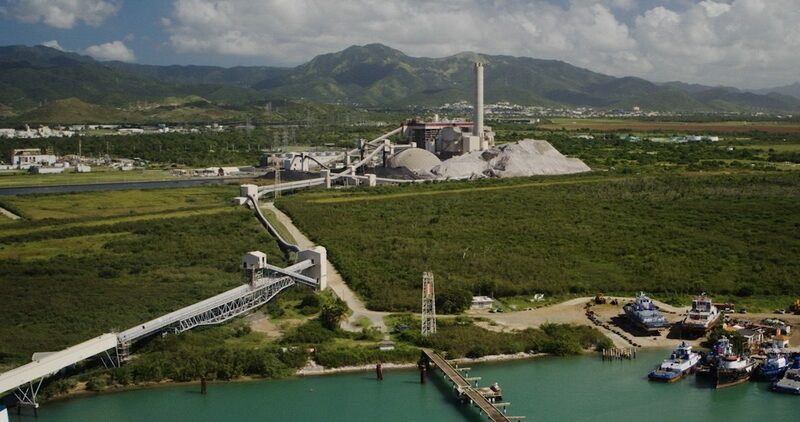 Some 32,155 tons of toxic ash were disposed in construction projects in Juncos, San Juan, Caguas, Dorado and Toa Alta between 2005 and 2007, the former vice president of the company, Ron Rodrique, confirmed in writing. There are another 1.9 million tons in the ground in Arroyo, Guayama, Salinas, Santa Isabel and Coamo, without barriers that isolate them from aquifers, streams and rivers. The Southern Aquifer is an elaborate network of drinking water wells located between the municipalities of Guayama and Peñuelas, from which about 30 million gallons a day are extracted and about 140,000 people from the southern region are served, explained Carl Axel Soderberg-Mayoral, the consultant for water issues for the EPA in Puerto Rico. For the 30,000 residents, schools, businesses and retail outlets in Salinas, it is the only potable water supply. A request for interview with the EPA was not answered. The secretary of the Department of Natural and Environmental Resources (DNER), Tania Vázquez-Rivera, and the president of AES Puerto Rico, Manuel Mata-Merino, have not responded to multiple interviews requests either. Last October, the DNER presented a draft of new regulations that proposes the perpetual permanence of toxic coal waste in Puerto Rico and even allows the unlimited use of coal ash in housing projects and roads, without control or monitoring barriers. It also authorizes that any developer may use up to 12,400 tons, without having to notify the public. Transporting that amount of coal ash requires contracting trucks for at least 600 loads. “That would be an environmental disaster for the island. It would be a death penalty sentence for many of the people affected, wherever they’re going to be used,” warned Cardona-Martínez. “The evidence is compelling. The pollutants that come with those ashes cause death, and being Puerto Rico a place that already has so many problems, doing that to our people would be disastrous,” he added. Judith Enck, the highest ranking official for the EPA in Puerto Rico until 2016, has also said that the regulation proposed by the DNER would be “a disastrous setback” with the potential to expose thousands of citizens to new risks. Given the results of the second sampling of AES wells, and the fact that two million tons of toxic ash may already be in contact with drinking water wells on the island, Ruth Santiago-Quiñones, attorney and environmental law activist, warned the Puerto Rican and federal agencies their obligation to intervene. “There is already enough evidence for the Department of Natural and Environmental Resources and the EPA to require AES to monitor and sample other locations, especially those near drinking water wells,” she said. “This could lead to a cause for (legal) action at the Puerto Rico level, because this (contamination) is prohibited by law. Water pollution is regulated by Puerto Rican laws, not just by federal rules,” she noted. At press time, Frances Segarra-Román, director of the DNER’s Office of Environmental Quality Control and Safety, assured that they are evaluating the comments submitted by citizens and that the draft authorizing the “beneficial uses” of coal ash is “in the process” of changes. Last Friday, March 15, during the Puerto Rico College of Chemists assembly, she said that the final version of those regulations will be released soon, after which it will be open -again- to public comments.